Yay Secret Recipe Club time again! If you're new here, each month SRC members are assigned a blog at random where they get to choose a recipe to make, keep it a secret and then all post on the same day. This month I was excited to be given Angel's Homestead by April who happens to be the fearless leader of SRC! 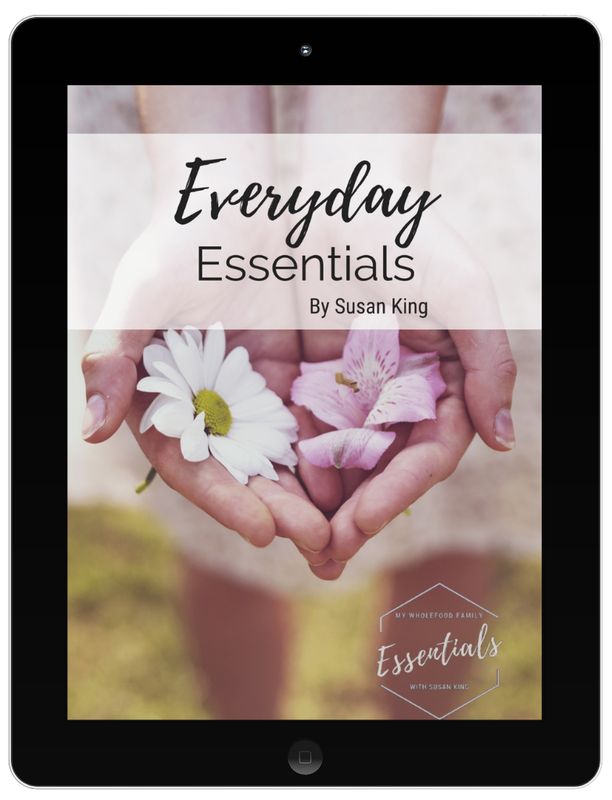 I really enjoyed taking the time to read through April's blog which is full of simple, easy to make and delicious recipes. I love her philosophy of frugal and sustainable living and this is really reflected in the food she makes for her family. I don't have time for complicated meals at the moment. Life with 2 little kids is busy and in a couple of months, will be getting a lot busier with the arrival of #3! We're due at the end of October so only about 9 weeks to go. I've made dumplings quite a few times, usually with a slow cooked beef casserole. They are such a great alternative to rice or pasta and so easy to whip up. My husband in particular is a big fan and really enjoyed these ones. We've been having unseasonably warm weather for August so I was lucky that the day I had set aside to make this for dinner was cold and windy and just perfect for a warming and hearty dish like this. 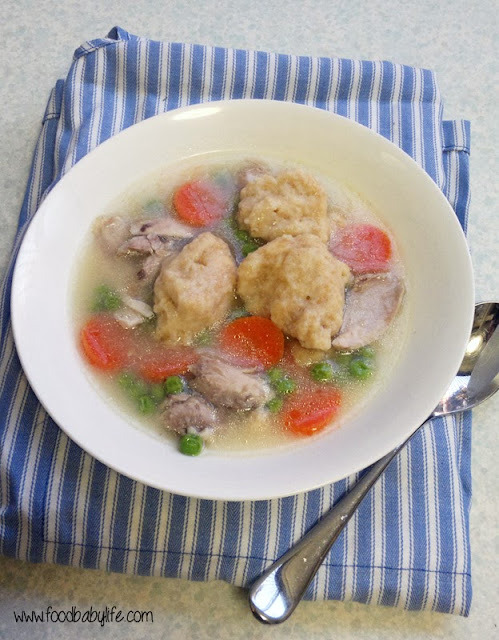 April has several chicken and dumplings recipes on her blog so I decided to choose the simplest one and make a couple of changes of my own. First I never use stock cubes because I am yet to find a good one without MSG and other yucky ingredients. So to boost the chicken flavour I browned the meat first and added some vegies to the broth while the chicken cooked. I also added some carrots and peas to the final dish for colour and because I can't help myself! I also used wholemeal flour because that's what I bake with most often. To make the broth, heat up a large pot over medium high heat and sear the chicken pieces, skin side down, until golden brown. Remove the pieces and any excess oil. Throw in the onion, garlic, carrot and celery and fry for a few minutes. Return the chicken to the pot and pour in the stock and water (the chicken should be completely covered). Reduce heat to medium, put the lid on and allow to simmer for around 40 minutes or until the chicken is cooked through and the meat is pulling away from the bones. Remove the chicken pieces then strain the broth through a fine metal strainer, discarding the vegies. Shred the chicken meat and return to the pot along with the sliced carrots, frozen peas and strained broth and place over medium-low heat. Check for seasoning and add salt if needed. To make the dumplings, mix together the flour and salt in a large bowl and set aside. Place the milk and butter in a small saucepan over medium-low heat until the butter is melted. Once melted, pour the milk and butter over the flour and mix until just combined. Drop the dumplings into the pot, a tablespoon at a time until all the mixture is used. Cover and let simmer for about 15 minutes. We all really enjoyed this, such a hearty and savoury meal for a cold day. Normally when I make chicken stock or soup I make it ahead of time so I can remove some of the fat. I didn't do that this time so there was quite a bit as you can see in the photo but I love that. It was a delicious dinner and one we'll be making again for sure. Looks like a big bowl of comfort! I think I could use some of that right now! What an easy and simple recipe for dinner. with school starting I could use any and all of these I can get! Great SRC pick! Yum, a great recipe! Congratulations on baby #3! Yum! I love chicken & dumplings... can't wait til it cools down here so I can make some! Is it wrong of me to say that I cannot wait for the weather to cool off so I can make all sorts of these warm, comforting dishes again without sweating to death. Looks amazing! Chicken and dumplings is always a welcome dinner! Yours looks so warm and inviting! Great choice! Such a comforting dish, perfect for fall. I have never made chicken and dumplings before. Your dish looks yummy! Must try! This looks so tasty and homely. Great SRC pick.